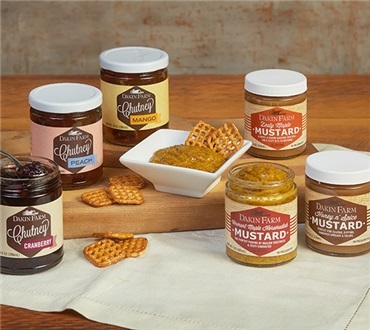 Our chutneys are made by hand in small, kettle stirred batches by a small family business in Massachusetts that we have worked with for more than two generations to bring you flavor you will not find in the super market. Chutney is similar in consistency to jelly and is used as a sweet and sour condiment. It is made with the finest fresh fruit, nuts and sugar to give it a sweet taste, and vinegar to give it a corresponding sour flavor. Choose peach chutney, mango chutney or cranberry chutney as the perfect complement to smoked meat, cheese, or to add an extra zing to your favorite sandwich. Each Chutney Jar is 11 oz. This is the best cranberry chutney! I love it on paninis and grilled chicken breasts! Should come in gallon size! I bought this while in New England. Put it in my husband's suitcase because no room in mine. Forgot his was a carry-on, so airline confiscated it when we left Boston. I wanted to cry! Ordered some after I got home. This is undoubtedly the BEST chutney I have ever tasted! Hubby agrees! Will be ordering more. Hate to part with it as a gift, but what a delightful gift! Very flavorful and great supplement to the boneless turkey breast. We were so happy to find this very tasteful chutney. When in London on a vacation we ordered a turkey sandwich on baguette that included swiss cheese, peppery lettuce, mayo, bread-n-butter type pickles and cranberry chutney. You must try it with this delicious chutney. After our friends try the sandwich, I always give them a jar as a gift so they can recreate it at home. Everyone loves how the chutney adds so much not-too-sweet, just right flavor the the sandwich.